Uzbek rice pilaf—osh palov or, in Russian, plov—has probably had a more meaningful place in my life than any other single dish. For the past quarter-century I have spent many hours preparing it, have enacted rituals around it, and have made it the centerpiece of significant gatherings in a way that I have not done with any other food. Plov is the national dish of the Uzbek people. Uzbeks recall that when the army of Alexander the Great passed through the ancient kingdom of Sogd, on the territory of modern-day Uzbekistan, he ate plov at a royal feast after conquering the Sogdian capital of Marakanda, modern-day Samarkand. To this day, plov is the centerpiece of almost every ritual event in Uzbek social life: at village gatherings to celebrate engagements, weddings, circumcisions of baby boys, the openings of a new businesses, and also at funerals. Uzbeks prepare the dish in gargantuan iron pots big enough to feed an entire neighborhood, and the preparation is a community effort. The basic ingredients are medium-grain rice, lamb, onions, carrots, garlic, cumin, coriander, salt, paprika, other fragrant spices, and lots of oil. These days the Uzbeks often add chickpeas to the mix. Numerous other variations are popular throughout Central Asia, and the wider world knows its cousins as pilafi (in Greece), pilau (in India), and many other similar names. Some variations, including in Azerbaijan, Iran, and Afghanistan, include nuts and dried fruits. The Uyghurs of Xinjiang make polu, which the Chinese call zhua fan (抓饭)—literally, rice that is grabbed with the hands. I first learned about plov in 1991, when I was studying in Moscow. I spent many wonderful evenings in the company of my Kazakh friends Aliya Malkeeva and Akhan Tleubaev at their communal apartment on Karl Marx Street, just inside the northeast corner of the Garden Ring road in central Moscow. 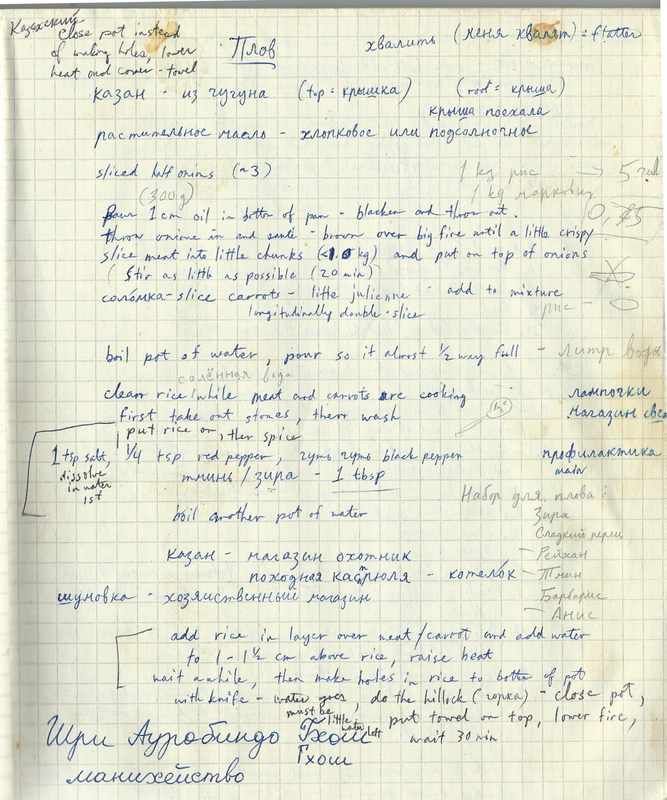 During one of those visits, Aliya made the dish on her stove, and I meticulously wrote down the recipe as she worked (see my handwritten notes, right). Something about the way she explained the recipe—the required tools, and the ingredients that had to be prepared just so—made it clear to me that this was no ordinary rice pilaf. She said that plov was usually made by men, but as a Kazakh, she could break with the tradition. She pulled out a well-seasoned cast-iron pot for the task, explaining that it was intended specifically for plov. She told me where to find one, and I made a careful note of it. In fall of 1991, while studying at the Moscow Energy Institute, I taught the recipe to my American classmates, and we made it several times during the semester in a pot we borrowed specially for the purpose. It was the centerpiece of our Thanksgiving feast, as we had no access to turkey in Moscow that year. I continued to prepare the dish at home in America for friends and relatives. In 1997 I traveled to Uzbekistan for a weekend to a wedding with friends, and I made a special trek to a market to buy a qozon—a real plov pot. For my second overseas posting in the Foreign Service, in 2005-07, the State Department sent me to Tashkent, where my life was filled with plov for more than two years. In 2004, while studying Uzbek language at the Foreign Service Institute, my class visited the home of our language instructors, and we devoted an entire afternoon to going to the market, preparing the ingredients, and assembling the plov together. We bought halal lamb at a local butcher, and added an unusual ingredient: quince. A few months later I spent two weeks in Andijon, in the eastern corner of Uzbekistan, and lived with a local family. I captured a video of an evening spent with my host brother and several of his friends at a choykhona—literally, a tea house, but this one specialized in plov. The managers allowed me into the kitchen to watch the plov being made, and they even let me stir the pot a little. (The video below is cued to start at the point where we are enjoying an appetizer of jizza—fried lamb fat—before launching into the plov.) While in Andijon, I procured a couple of kilos of reddish devzira rice, the most prized rice for plov, to bring home. In Tashkent, I attended several events centered around plov: a wedding or two, a funeral, and an annual feast prepared by the Embassy’s local staff on our newly opened compound, where a pot of plov contained an entire lamb and fed more than 200 people. While the ingredients and their exact proportions are somewhat flexible, some elements of this recipe are more important than others. Using a well-seasoned cast-iron pot over an open fire (as on a gas stove) is highly desirable: the pot retains heat well, allows for even heating, and has a certain non-stick quality, while the fire on a gas stove can be quickly and easily adjusted as needed. In my experience, thin aluminum and enamel pots cause the food to scorch, while stainless steel sticks easily and is nearly impossible to clean afterwards. Lamb is the traditional meat, but I’ve had plov with beef, and even chicken. Include the bones to make the meat more tender and flavorful. Don’t be afraid of the fat, but try not to use gristly meat. Onions and carrots are essential. The onions will disappear in the course of cooking, melting into the rice and leaving only their fragrant aroma. The carrots, if cut properly, will soften and shrink to the point where you can barely taste them. Garlic is almost always included, and you should use it. Even people who dislike the taste of garlic will not recognize the sweet, creamy substance that melts out of the garlic skins after being cooked in a pot of plov. Chickpeas are optional, but they add a pleasing variety of texture and flavor. Cumin and paprika are standard spices in traditional Uzbek plov. Others are variable and up to your personal taste. Farmers’ markets in Moscow sell spice blends specially for plov, which generally contain cumin, paprika, and barberries, and less often some combination of saffron, turmeric, coriander, and dried vegetables. Allow 2-3 hours to prepare. Serves 8-10 easily. Approx. 1 cup vegetable oil – a neutral-flavored oil like canola or sunflower is fine. The Uzbeks usually use cottonseed oil, which is plentiful and cheap in that country. It is, however, laced with high levels of pesticides. 1-2 heads of garlic, outer skin removed. The individual cloves do not need to be separated. Rinse rice well and drain, set aside. In a separate pot, heat about 2½ quarts of water to a simmer while preparing the other ingredients. Heat oil in a large (at least 8-quart) pot and cook onions 10-15 minutes, stirring regularly, until they turn golden. Add meat, and cook, stirring periodically, until meat is completely browned. Any moisture in the pot should almost completely evaporate before continuing. Add carrots, salt, and spices, stir well, and continue cooking for several minutes. Add garlic and chickpeas (if using), pressing the heads of garlic into the meat-and-vegetable mixture. Add simmering water just to cover, and allow to boil gently for about 20 minutes. Add rice in an even layer on top of the other ingredients, and add more hot water (pouring over the back of a skimmer to avoid stirring the rice up too much). The water level should be about 1 centimeter above the rice. Continue cooking uncovered. As the rice absorbs the water, periodically poke the handle of a wooden spoon through the rice to the bottom of the pot to monitor the water level. Once the water level drops nearly to the bottom of the pot, proceed to the next step. Using a spoon or skimmer, smooth over the rice and (optional) cover with an upside-down plate to hold in the moisture. Then cover the pot tightly with its own lid, reduce the heat to its lowest level, and allow to steam for 30 minutes until the rice is completely tender. Remove from heat, stir thoroughly, and serve. This entry was posted in Main Courses and tagged Grains, Lamb by Baron. Bookmark the permalink.